One of the major bonuses of being a musician is that it tends to be a career or hobby that can be performed well into the senior years. 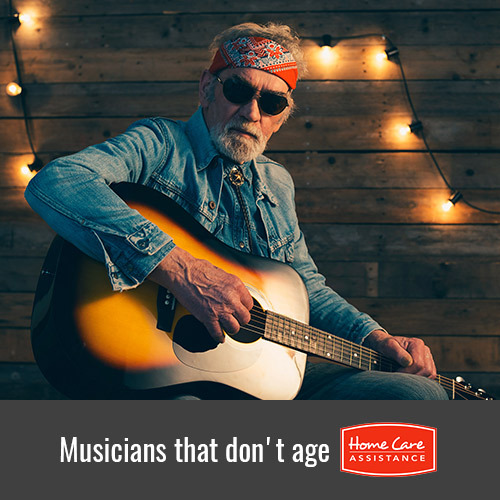 Many famous American musicians have made this idea a reality, and Harrisburg elderly care experts briefly discuss the lives of 4 who are still doing what they do best past age 65. Born Patricia Louise Holte-Edwards 72 years ago, Patti LaBelle has been churning out hits for more than 50 years. LaBelle’s mother, grandmother, and aunt all had diabetes, and LaBelle was diagnosed with the condition in 1994. She changed her eating habits to focus on moderation and was able to stop taking some of her medications. Today, LaBelle sounds as good as ever, she recently competed on the hit show Dancing with the Stars, and she even has her own line of food products. Even at the age of 67, The Boss is legendary for his stamina and is known for tours that often include over 100 shows. Unknown to fans, Springsteen secretly battled with depression for decades. He recently revealed his struggles with mental illness in his memoir, Born to Run, in hopes of removing the stigma that still remains around mental illness. Springsteen worked through his depression with years of therapy and antidepressant medications. This country crooner is known for his trademark braids and unmistakable voice. At the age of 83, Nelson is still delighting audiences and is active in a number of political causes. One key to Nelson’s longevity is that he has always been physically active. When he was in school, Nelson played baseball, football, and participated in track and field. Today, he has a black belt in kung fu, which he credits with helping him maintain a healthy connection between mind, body, and spirit. At the age of 90, Bennett is still making the charts and selling out shows thanks to his successful collaborations with Lady Gaga. Bennett credits his ability to keep up with artists 60 years his junior to exercising 3 times a week. He also continues to challenge himself professionally. In an interview with the New York Daily News, Bennett told the interviewer he is always looking ahead and studying to become better. Playing music or participating in another creative hobby is a great way for seniors to boost their overall health. Another way to remain healthy in the golden years is to hire a professional caregiver from Home Care Assistance. We offer a program called the Balanced Care Method, which encourages seniors to focus on lifestyle factors that can increase their longevity. For more information on the respite and 24-hour care Harrisburg, PA, families trust, call one of our friendly Care Managers at (717) 540-4663 to schedule a free in-home consultation.